The Force is strong with this one! Star Wars pretty much broke the internet last weekend with footage from the new movie and two TV shows. Thousands of fans took to Twitter, Insta and YouTube as Star Wars Celebration got into full swing. And, if you weren't already hyped by THAT trailer for Episode Nine: The Rise of Skywalker, on Friday, (and the reveal that Darth Sidious/Emperor Palpatine is returning) then, firstly why not??? Secondly, maybe a sneak peak of The Mandalorian and new Clone Wars TV series will whet your Star Wars appetite. 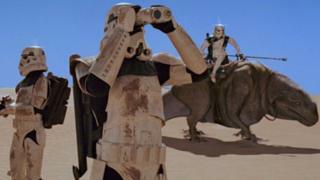 Still in the dark (side) about what to expect from Star Wars on TV, here's a run-down. If you weren't lucky enough to go to Star Wars Celebration in Chicago and thought you could replicate the experience by streaming the event online, think again, because for internet audiences, they only went and blocked the trailer and footage of the highly anticipated Mandalorian!! Unlucky! But don't worry - Newsround can tell you all about it. 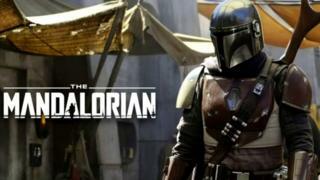 The Mandalorian, is the first ever live action Star Wars TV series and will focus on a band of mercenaries. 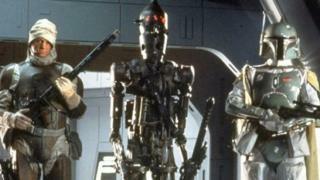 If you aren't aware, Mandalorians are the group responsible for the legendary character and bounty hunter Boba Fett. Executive Producer Jon Favreau says we can expect to see lots of new species, races and star-ships in The Mandalorian. And, along with fellow producer Dave Filoni, as part of the panel at Star Wars Celebration, they revealed the new show is set five years years after Return of the Jedi. That means we'll see the Star Wars universe at a time where the Empire is struggling to maintain control, after its defeat at the end of Episode Six. Could that mean that we see Boba Fett showing up in this new series, presuming he survived the events of ROTJ? Could the Mandalorian be Boba Fett all along but with new armour? Only time will tell. Pedro Pascal, who plays the Mandalorian also joined the panel at Celebration, but was pretty secretive about what we can expect. "The Mandalorian is a mysterious lone gunfighter in the outer reaches of the galaxy," he said. "Some might say he has questionable moral character." As for the full trailer - we see the Mandalorian's ship, the Razorcrest, another cantina, lots of aliens, loads of Stormtroopers, including one wielding a flame-thrower, there's a Tie-Fighter and the famous bounty hunting IG-88 droid spinning and shooting as it fights a group of troopers. 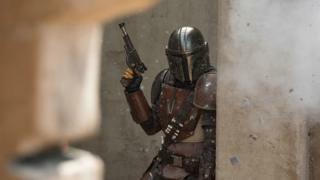 The whole thing looks incredibly action packed, and we'll see if the show lives up to the hype when The Mandalorian is released on the DisneyPlus streaming service on 12 November. Before we move onto the Clone Wars, here's one final interesting bit of trivia from The Madalorian, that came out during Star Wars Celebration. The show didn't have enough Stormtroopers for a scene during filming - but producers knew they could rely on the fans to help out - so members of the 501st Stormtrooper cosplay group got to play the roles. That's pretty cool! The Mandalorian isn't the only Star Wars TV show on the way! 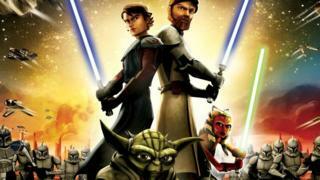 In the words of Yoda: 'Begun, the Clone Wars has', six years after it was cancelled prematurely. Now, The Clone Wars animated series is back to tell a story that focuses on Padawan, Ahsoka Tano, her master Anakin Skywalker and his master Obi-Wan Kenobi as they battle against droids during the events between Episode Two: Attack of the Clones and Episode Three: Revenge of the Sith. The trailer opens with a scene from series five where Ahsoka decides to leave the Jedi Order, before moving on to brand new footage. In the new stuff, we get to see her starting a new life in the murky underworld of the city planet, Coruscant. Elsewhere, Clone Commander Rex remembers his fallen brothers and Yoda is 'no longer certain if anyone ever wins a war'. Drawing on inspiration from half-finished animation and ideas from before the original series got cancelled, the new Clone Wars, with 12 episodes set to run on DisneyPlus next year, will conclude with the Siege of Mandalore storyline. (Yes, that means more Mandalorians). 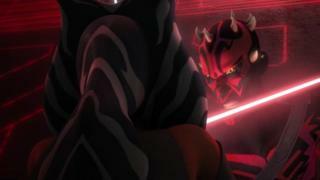 It'll feature an epic dual between Ahsoka and Darth Maul, and there was a small glimpse of that battle as the trailer came to an end. All things considered, 2019 is set to be a huge year for Star Wars on the big and small screens! Let us know in the comments if you're excited! Or is there just too much Star Wars at the moment? #️⃣ Never seen more than 1 Star Wars film!